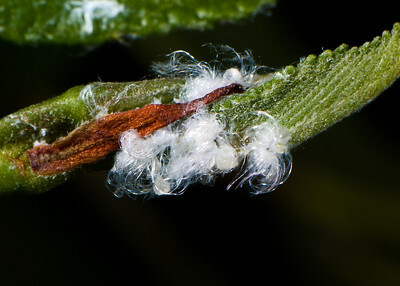 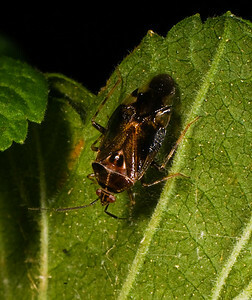 Spittlebug nymphs are developing inside. 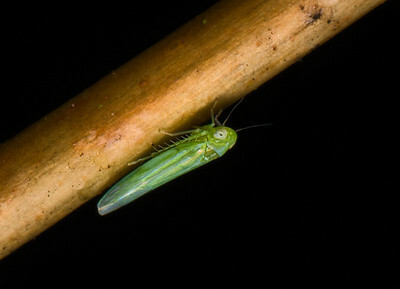 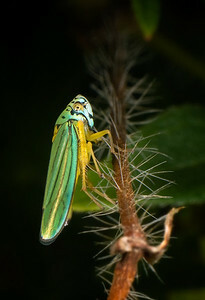 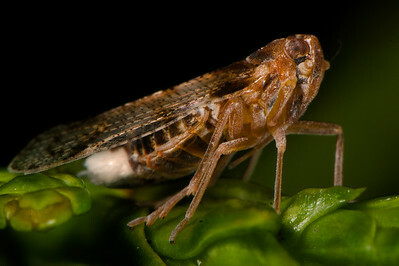 Leafhopper: head-on view, with red eyes on a yellow head. 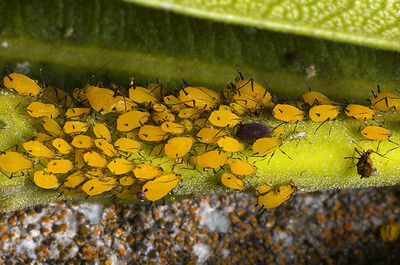 Many of these aphids have fallen victim to a parasitoid. 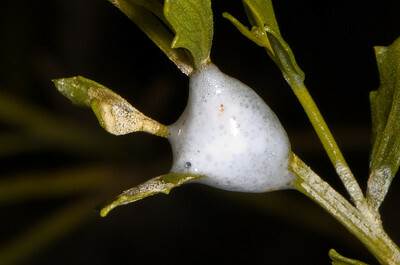 An insect (probably a small wasp) deposited an egg in the aphid. 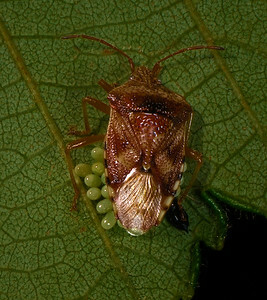 When the egg hatched, the larva ate the aphid from the inside. 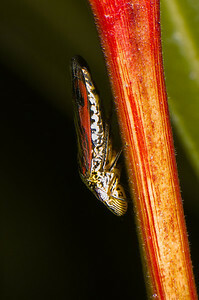 The larva then pupated. 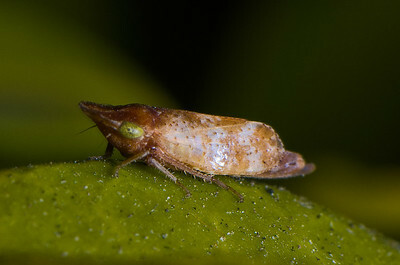 When it emerged as an adult, it cut a hole in the aphid's exoskeleton and crawled out. 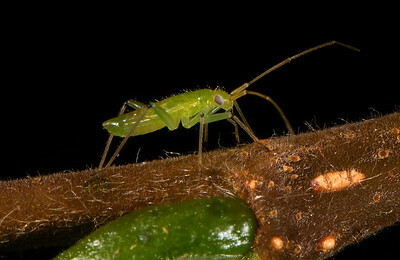 The devoured aphid is called an "aphid mummy." 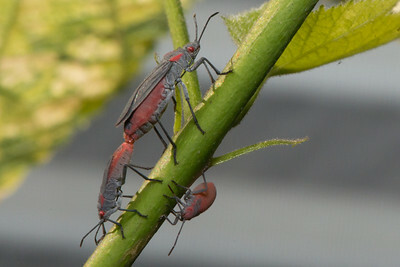 Aphids. 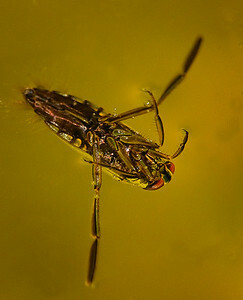 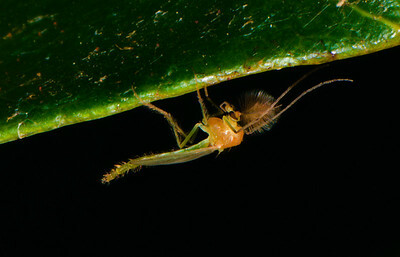 The nymphs are translucent and more difficult to see. 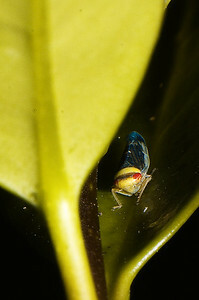 This Leafhopper is very small, but the aphid is even smaller. 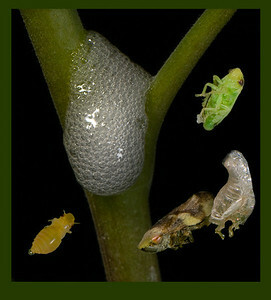 Spittlebugs: Composite showing different stages of development. 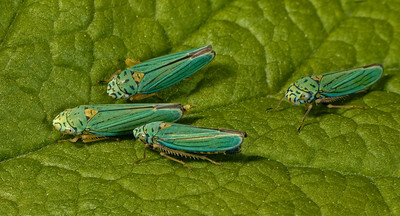 Emerging adult in the lower right has just molted. 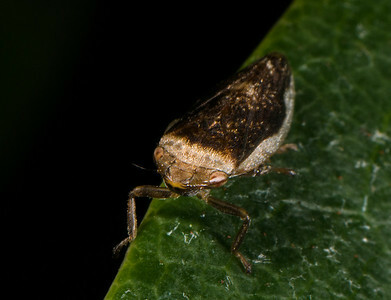 This very small Stinkbug has just defecated. 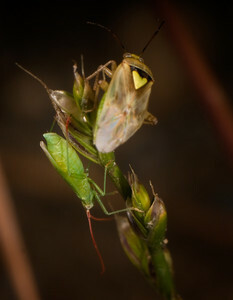 Stink Bug and well-camouflaged Plant Bug sharing a blade of grass. 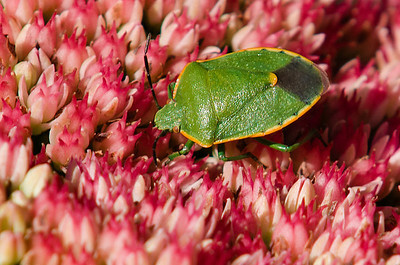 One of several species of Stink Bugs in the garden. 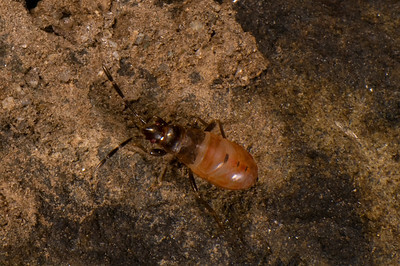 Stink Bug nymph, found under a rock. 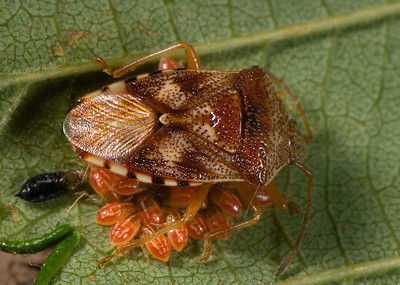 An earlier photo shows this Stink Bug brood as just-laid, small, lime-green eggs. 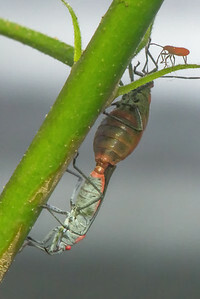 After several days, the eggs are now nymphs, still under their mother's four wings. 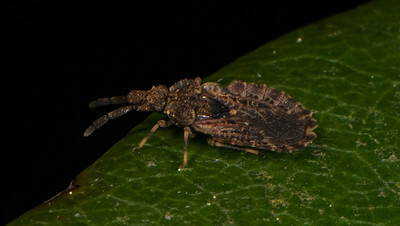 The half-formed wings indicate that this is a nymph. 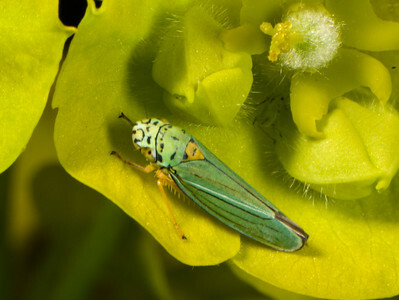 But, I don't know what it will become when mature. 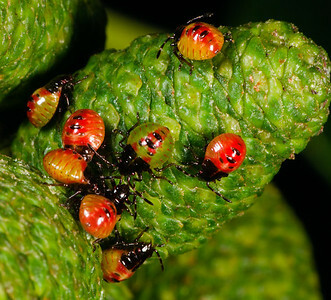 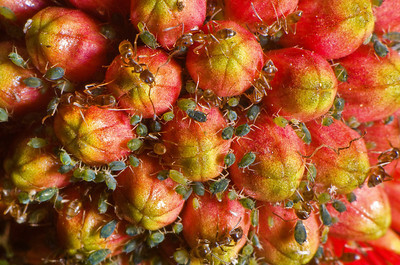 Aphids under a leaf. 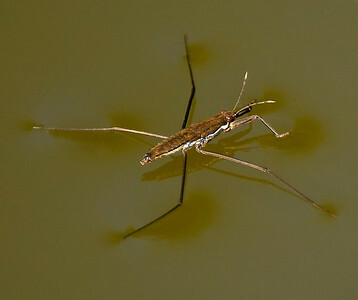 There are a few adults and many nymphs. 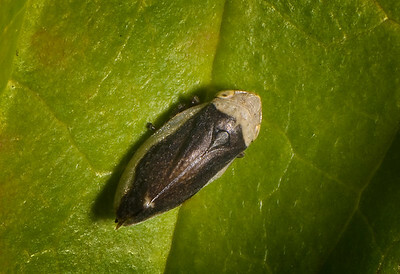 One adult is winged. 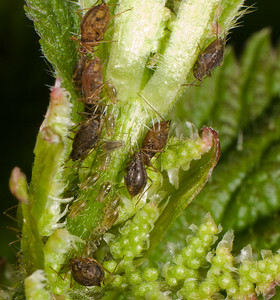 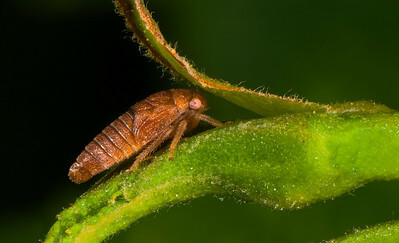 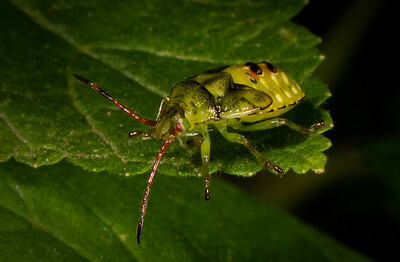 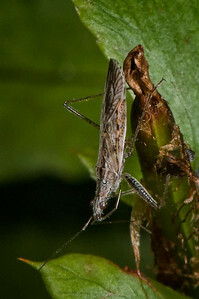 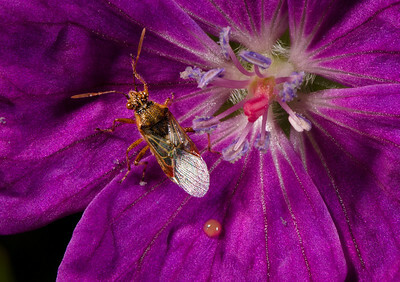 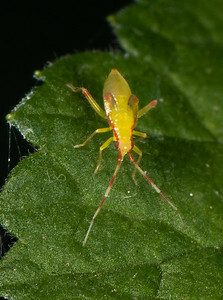 There are also two "aphid-lions" - larvae - each feeding on an aphid nymph. 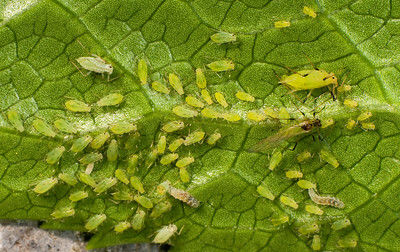 Many of the aphids are lined up along the main vein of the leaf - or an offshoot of the main vein - feeding. 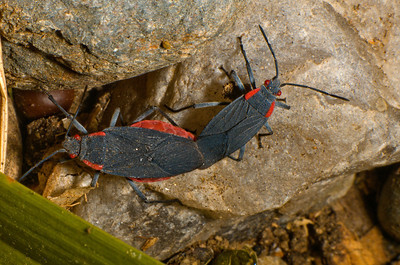 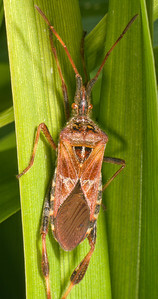 A species of Flat Bug, a family of the so-called "true bugs." 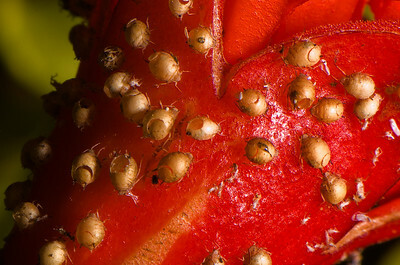 It feeds on fungi. 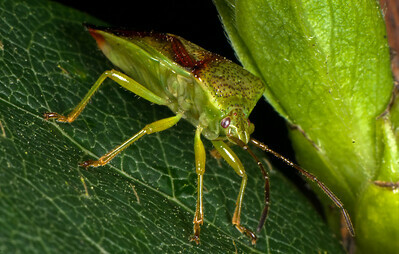 One of about a half-dozen species of Stink Bugs in the neighborhood. 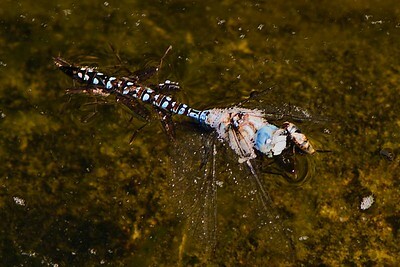 Lower pond: Dead Blue-eyed Darner dragonfly being consumed by ~10 Backswimmers - one of which has climbed out of the water onto the dragonfly's head. 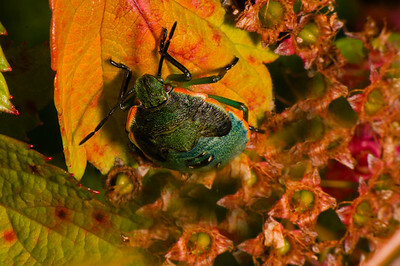 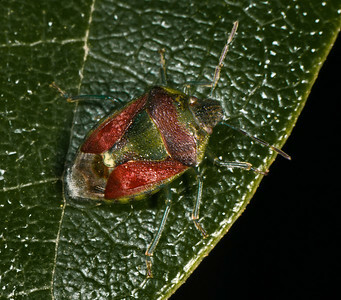 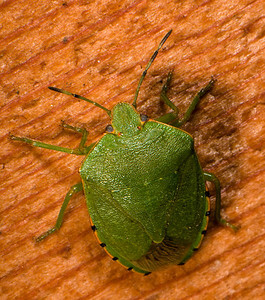 Concheuela Bug - a kind of Stink Bug. 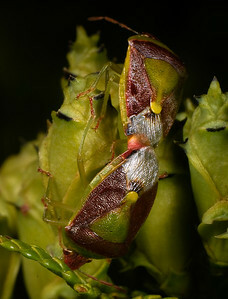 Stink Bug nymphs - as adults they are green with dark brown coloration on their backs.